How to Get from Faro Airport to Portimao? If you are planning on travelling to Portimao soon you will most likely arrive at Faro Airport. Once there, unless you know someone in the Algarve you will certainly need a transport to Portimao. If you want to avoid all the hassle of catching an Algarve public bus to Portimao carrying your luggage around and if you are not willing to wait in lines or pay for expensive normal taxi fares to Portimao, your best option is to book online a private Faro Airport transfer to Portimao. Select Portimao as your transfer destination area and provide us with flight details, Portimao accommodation address and contact. We automatically process your request for transport availability to Portimao and send you a booking voucher with transfer confirmation in a few seconds. At Faro Airport arrivals hall a friendly driver will be waiting for you next to our company sign. For the return transfer we will pick you up from the same address in Portimao. And remember, you can always pay later to the driver for both your arrival and return Portimao transfer. How far is Portimao from Faro Airport? How much will it cost? How long? The travel distance between Faro Airport and Portimao is 64Km and transfer time takes approximatly 65mins under normal traffic conditions. For better service response we may choose a route to Portimao through the highway. 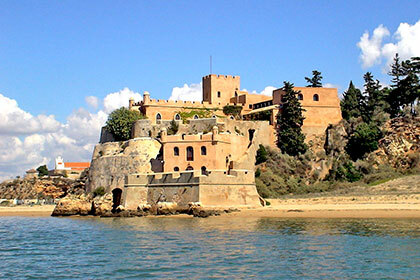 Our private Faro taxi transfers to Portimao have fixed rates and represent a much more faster, affordable and hassle free alternative transport to Portimao A friendly driver will meet and greet you at Faro Airport arrivals hall. He will assist you with all the luggage and guide you to your assigned transfer vehicle, which may vary from an executive saloon or estate car for up to 4 passengers to a modern people carrier van or mini-bus up to 16 passengers. In approximately 65 minutes you will be relaxing at your Portimao resort, hotel or private villa. Welcome to the Algarve! Algarve biggest city, Portimao has become one of the main holiday destination, mainly because of Praia da Rocha beach resort. The city is bounded by the Arade river estuary in the east and by the Atlantic Ocen in the South. Just across the river stays Ferragudo, the most typical town in the Algarve. Nowadays Portimao is nice mixture of typical narrow cobbled streets with modern buildings and infrastructures. It has the biggest sea port in the Algarve where many cruise ships stay for a few days. The modern Marina next to the city fortress is already famous in the sailing world. Portimao is the most active area in the Algarve during the Summer. It hosts many sporting events like the Beach Soccer world cup and organises lots of music and food events like the sardines festival. It's easy to find boat trips for fishing, trips to the caves, dolphin watching or trips in the Arade river al the way to Silves. There are several golf courses nearby and lots of nice shopping spots. Portimao has also an international race track that hosts one of the Super Bikes races. Our private transfer service at Faro Airport will transport you directly to and from any resort, hotel or private holiday villas / apartments in the Portimao area: Praia da Rocha, Penina, Alto Golf Country Club, Ferragudo, Gramacho and Vale da Pinta Resorts & Golf Courses. To pre-book taxi transfers from Faro Airport to Portimao or to other near by destinations take a look at our full list of taxi transfers fares & prices for all the covered locations in the Algarve.